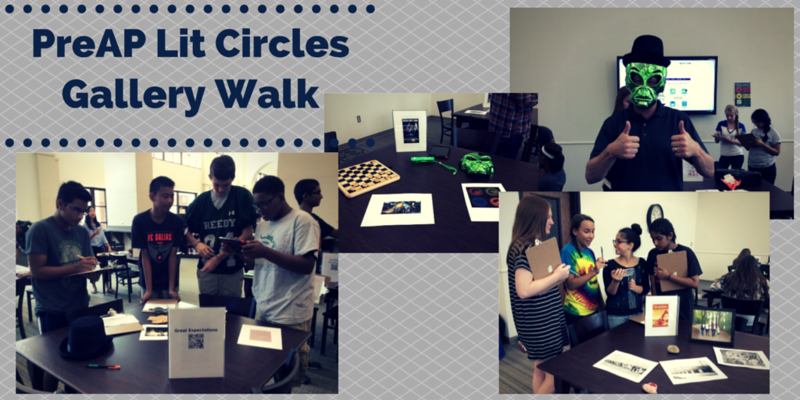 This week at the #ReedyLibrary our freshman PreAP students came to the library to do a Gallery Walk. They are getting ready to start Literature Circles, so the students came to the library to learn a little more about the book they could choose to read. Rather than doing book talks, I thought it would be fun to have stations for each of the 11 titles. A each station we had a QR Code to a video representing the book and an iPad. We also came up with a list of objects that could represent themes and/ or characters from the books. We encouraged the students to use their own devices, pick up and handle the objects that we had laid out, and discuss they thought the objects might represent. Here is a link to the Student Response Form we used. See pics of our students at the stations below.